Access to a web server. For this I installed and started up MAMP on my Mac. A web service that can take in and show data coming in from our cc3000. We’ll use a simple PHP script. 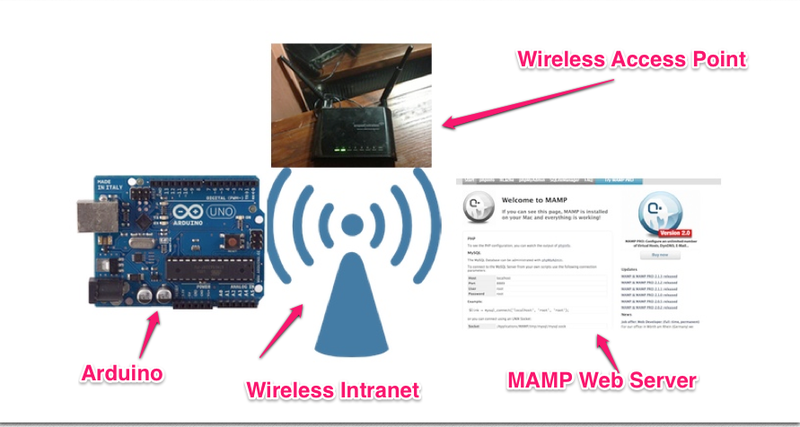 An Arduino sketch that sends data over the WiFi to the web service. What luck! Marco Schwartz wrote a blog post on the Open Home Automation web site that does pretty much what we want to do. Marco’s example takes temperature readings and sends them via WiFi to a Web Server that is running HTML embedded with simple PHP scripts. As noted in Marco’s post, the WiFi Weather Project’s GitHub repository is located here. I used Marco’s wifi_weather_station.ino as well as a few of the example sketches that are included in AdaFruit’s cc3000 libraries. Follow Marco’s instructions and code to get the PHP scripts up and running on your local web server. I wrote a sketch that sends a PHP GET request to my local web server. I borrowed heavily from Marco’s sketch as well as the examples that come from Adafruits c3000 library. Thank you to both. The sketches were valuable learning tools and did the majority of the “heavy lifting” needed to be done to send data to a PHP service from an Arduino that communicates with a cc3000. First, download the sketch I am about to walk through and open in up in your Arduino IDE. Once that is done, load the simplePHPGet.ino sketch into your Arduino IDE. For this step I am not going to hook up a sensor. 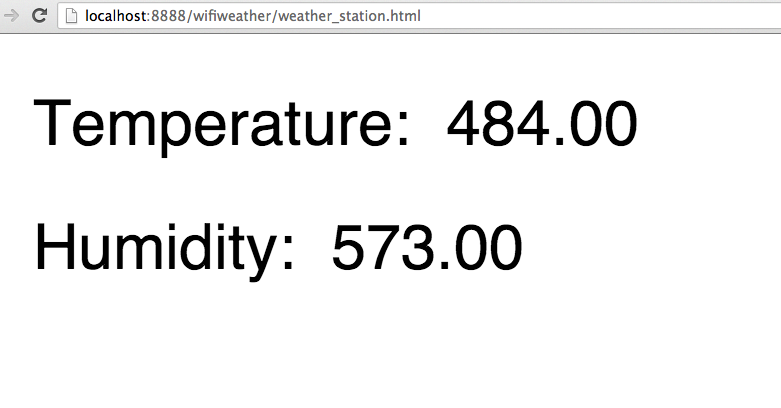 Rather, I’ll set random values for the temperature and humidity and then create a “GET” request. This request is then sent to my MAMP Web Server. The MAMP Web Server looks for files in the wifiweather folder that I created and put Marco’s files in. The PHP script in sensor.php runs which updates the Web Page with the (randomly generated) values for temperature and humidity. The Web Server sends back the results. Connecting to henry2...Waiting to connect...connected! An Arduino. I used an Arduino Uno. 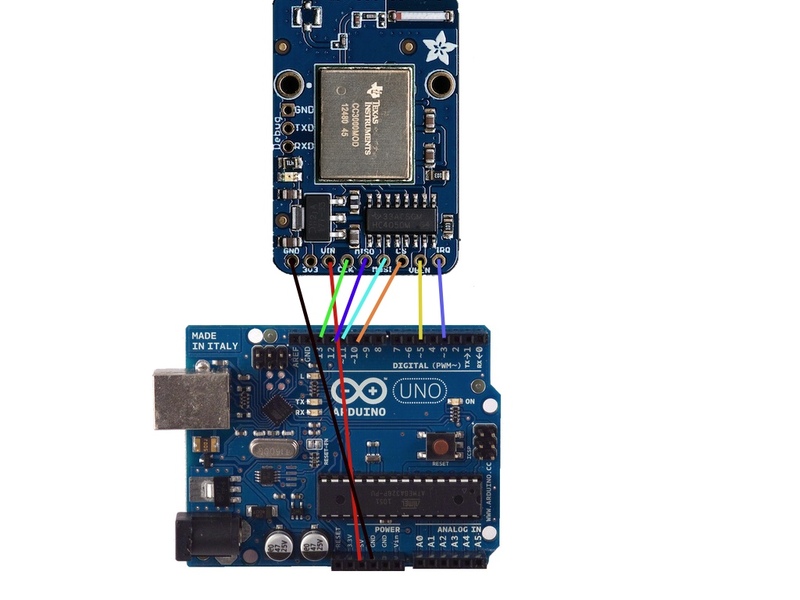 An 802.11 chip that can send and receive data from an Arduino. I purchased the CC3000 from AdaFruit. AdaFruit has started to provide TI’s CC3000 WiFi chip. They wrote a library to talk to the CC3000 from an Arduino Sketch. Adafruit is an excellent company to buy prototype parts from. The forums are awesome. Their tutorials are extremely helpful. I’ve been very happy with the product, support, and learning offered from Adafruit. An Arduino sketch that communicates with the Web Server. The first step is to get the CC3000 talking to the Arduino. and usually a default of 10 to connect to a slave’s SS. You may want to refer to the SPI entry in Wikipedia if the acronyms and what they represent are unfamiliar to you. Each slave device needs a different pin to talk to the slave’s SS device. This can be a challenge because it means the component and the library that speaks to the Arduino must support configuring a different pin to SS. Components/libraries should do this easily so that multiple components can use SPI. Luckily Adafruit’s breakout does do this easily. Yay! There will also be another RF component to talk between Arduinos within the house. This component will also use SPI. How this is handled will be discussed in a later post. Once you have the cc3000 wired up to the Arduino, grab AdaFruit’s cc3000 library on GitHub library and run the buildtest sketch. Don’t forget to set the WiFi’s SSID and password to the values used on the WiFi you wish to connect to! Yippee! The CC3000 connected to the wireless network. BUT bummer…name resolution of http://www.adafruit.com did not return its address and pinging http://www.adafruit.com didn’t work. Typical isn’t it? There is excitement on what works “easily” in our prototypes and confusion (leading to frustration) on a few things that should work. After several runs, the call to cc3000.getHostByName(WEBSITE, &ip) resolved. This is certainly not robust. I assume I’ll run into this “bug” in the near future and thus will wait to debug further. However, pinging still doesn’t work. I can’t figure out why so I am asking about it within Adafruit’s forum. And Yippee! The cc3000 connected with http://www.adafruit.com and then returned the contents of http://www.adafruit.com/testwifi/index.html. This is a test of the CC3000 module! Adafruit_CC3000_Client::No more data, and closed! On to sending data from the cc3000 to a web server running on the same intranet.